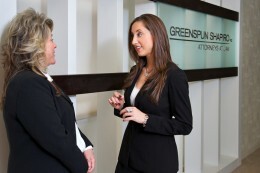 Greenspun Shapiro criminal defense attorney Anastasia Kranias describes her typical day as a criminal defense lawyer. Since graduating law school, I have been asked hundreds of times about the type of law I practice. I always find it amusing to watch people raise their eyebrows when I respond, “criminal defense!” with an enthusiastic smile. The next question is often, “how do you defend criminals?” with a somewhat disturbed expression. This answer is easy for me. Most “criminals,” that is, those who are charged with criminal offenses, are people, just like you and me. Educated, clean records, husbands, wives, daughters, teachers, military personnel, government workers, and yes, lawyers — and I have the opportunity to be the only positive on the worst day of their lives. Quite frankly, it’s rewarding. That’s the big secret. I help people, not criminals, and I like it. What is it Like to be a Criminal Defense Lawyer? Typically, my day as a criminal defense lawyer begins with court. I can often be found pacing the hallways of a general district court, calming down clients, talking to prosecutors, and looking for police officers. While it may look like fun, as I wave hello to fellow attorneys, and laugh with police officers, what I am really doing is putting my best foot forward to get the best result for my client. The fun ends, so to speak, when I enter a small vestibule outside the courtroom and spend time negotiating with prosecutors, pulling cases, statutes, pictures, evaluations, and reports out of large brown folders. If a favorable plea agreement is reached, I go to my client, and watch them breathe a huge sigh of relief. If not, we proceed to trial that morning. When I get back to the office, I exchange stories with my colleagues, seeking advice on different cases. But then I receive a phone call from potential client #1 in need of a criminal defense lawyer. As I spend time on the phone, I see notification on my computer screen that another client has emailed me about their pending case, often in a panic. I finish my phone call, switch gears, and contact client #2, trying to bring some peace back into their life. Then I begin to research the law, draft pleadings or letters. I usually have to put these on hold to meet with client #3, who has come in for a consultation on a new charge. Sometimes the story is clear: I had 4 drinks, I drove home, was stopped by the police for speeding, and blew a 0.11. I was arrested and I need help. Sometimes the story is less clear, and can sound as confusing as: I was getting coffee and the officer arrested me for turning left improperly and suddenly the people started yelling and the glass window shattered before I fell and then called my mom. I woke up in the hospital and have 4 new charges and I need help. After the consultation is complete, I return to my office, continue to draft pleadings, and prepare for cases later in the week. Repeat calls, emails, and meetings as described above throughout this time period. As a criminal defense attorney, the odds are usually stacked against my clients. In other words, generally, there is evidence implicating my client, which led to their arrest. However, I enjoy the challenge trying to win, the success in mitigating damage, and absolutely love watching the faces and hearing the gratitude of clients who end up in a better place than when they first called. As a criminal defense attorney, I have the opportunity to help people every day, and I like it. If you need help with a legal matter, call the trusted team of criminal defense attorneys at Greenspun Shapiro PC. Regardless of the level of complexity of your case, you can rely on our team to aggressively defend your rights while helping you successfully resolve your case. Start by calling our Fairfax office at 703-352-0100 or by emailing us using the contact form. We provide legal services to our clients in Fairfax, Annandale, Chantilly, Reston, Manassas, Leesburg, Arlington, Alexandria and throughout Northern Virginia.